A critical level of abstraction in the modeling of a large, complex system is its architecture. At an architectural level one models the principal system elements and their interaction. Architectural models are typically used to provide an intellectually tractable, birds-eye view of a system and to permit design-time reasoning about system-level concerns such as performance, reliability, portability, and conformance to external standards and architectural styles. In practice most architectural descriptions are informal documents. They are usually centered on box-and-line diagrams, with explanatory prose. Visual conventions are idiosyncratic, and usually project specific. As a result, architectural descriptions are only vaguely understood by developers, they cannot be analyzed for consistency or completeness, they are only hypothetically related to implementations, their properties cannot be enforced as a system evolves, and they cannot be supported by tools to help software architects with their tasks. There exist several architecture description languages, but we are interested in the use of UML. We aim to identify requirements on architectural modeling and how different modeling concepts of UML meet these requirements. 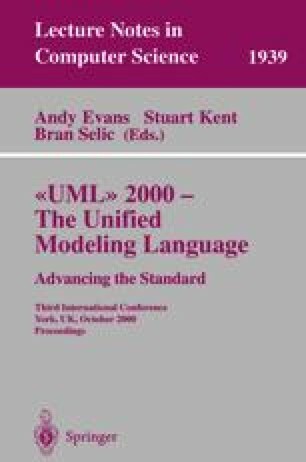 This paper is not intended as a critique of the UML but as a discussion of approaches to modeling architectures that have been tried, more or less successfully. This paper was influenced by discussions with Steve Mellor and Ed Seidewitz,whose comments and feedback are greatly appreciated.